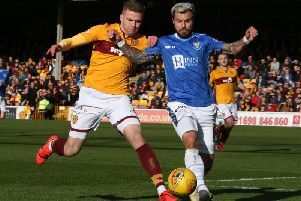 Motherwell’s top six hopes are hanging by a thread but – ahead of the game at Aberdeen this Wednesday night – manager Stephen Robinson still believes it is possible. 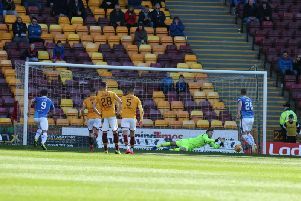 The Steelmen sunk St Johnstone 3-0 at Fir Park on Saturday but other weekend results went against ’Well who are now five points behind sixth-placed Hibs with just two fixtures remaining until the Scottish Premiership split. “The top six is still alive and we had to make sure it was,” Robinson said. “This was a big, big result for us. St Johnstone are a very hard team to play against. “We had to do the dirty stuff, we had to match them, battle and I thought we could have scored more goals. Nothing less than two wins will suffice for ’Well at Pittodrie and in Sunday’s home clash against Rangers if they are to finish in the top half. ’Well also require Hibs to lose at home to Kilmarnock tonight and at Hearts on Saturday. But the fine performances of goalscorer Elliott Frear and fellow sub Chris Cadden on Saturday has boosted the mood down Fir Park way. “Elliott’s probably been the most unfortunate player in the squad,” Robbo said. “He’s the best player in training every day. “He was my best player against Ross County and Hamilton when we weren’t playing particularly well. “He was unfortunate in that he got an injury and the two boys that came in – Gboly and Jake – were very, very good. But the lesson is you can’t rest on your laurels.